Now, 70 years after the end of the war in Europe, Richard Borg & the Days of Wonder Team are happy to offer you four new scenarios to commemorate the last battles of 1945. Relieve the men of the 79th US Infantry trapped in the two encircled towns of Hatten & Rittershof; take command of the 44th British Brigade and its flamethrower tanks during Operation Veritable; cross the Rhine with the men of the “All American” 82nd Airborne; or gather your friends to assault – or defend – the infamous Seelow Heights, last line of defense before Berlin, in a massive Overlord battle. Here at HQ, we’ve printed up your new orders in a leaflet that will be available in May from the Days of Wonder web store for free (plus shipping & handling), as well as from some retailers in Europe. This leaflet will also be available at game conventions where Days of Wonder or its representatives are present. Last but not least, you can also download it from our website. 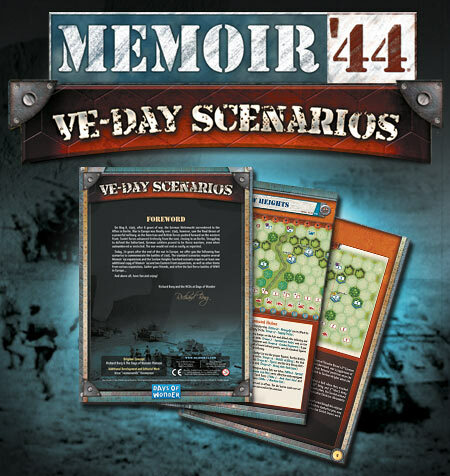 Note: Sargeant Frank recommends adding the VE-Day Scenarios to an order with another game or expansion to reduce your shipping costs from the Days of Wonder web store. This expansion is not a standalone game and requires at least one original copy of Memoir ’44. The standard scenarios also require several Memoir ’44 expansions and the Seelow Heights Overlord scenario requires at least one additional copy of Memoir ’44 and two Eastern Front expansions, as well as other items from various expansions. Erratum: In scenario #1, “Hatten & Rittershofen” the Mobile Artillery Unit (bottom left of the board) should be an Allied unit, not an Axis one (the Special Rules text is correct). This entry was posted on Wednesday, May 6th, 2015 at 14:05 and is filed under Events, Games, Memoir'44, News. You can follow any responses to this entry through the RSS 2.0 feed. Both comments and pings are currently closed. Thank you for making these available. My compliments to the designers. There’s a lot of info. for two pages. Is there a version where each scenario is a single page? Maybe a printing option I don’t know about. I think what I’m looking for is a more printer friendly version. Upon further examination, the file is a two-page version of a five-page document. I think that’s where my trouble is.